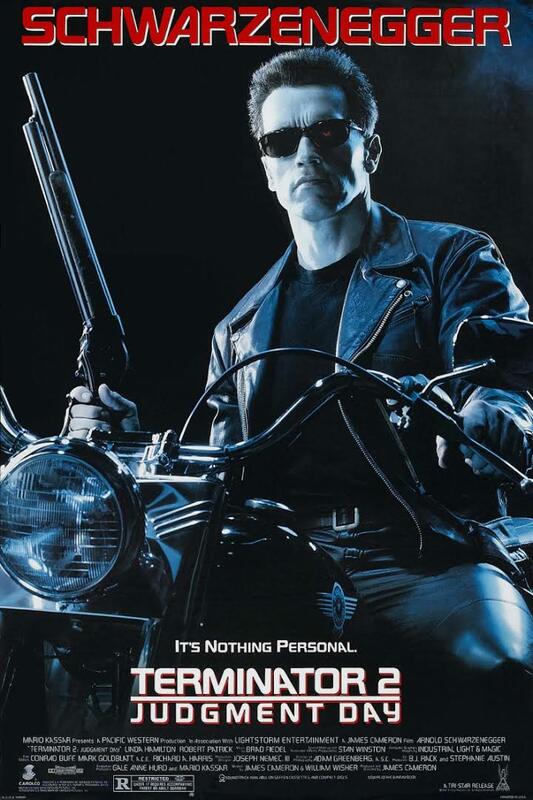 Hot on the heels of my Terminator review, comes my review of the sequel (the aptly named Terminator 2: Judgement Day). It’s clear from the start of the film that Terminator 2 is a different animal to the first installment. Whereas T1 was made on a relative shoestring (and the technology behind the SFX wasn’t as sophisticated), T2 has a bigger budget and more pulling power. By this point, James Cameron (the director) had become a big name in Hollywood, and he’d taken his time to ensure he crafted the sort of sequel he wanted to make. Waiting seven years to make a sequel would be unfathomable to Hollywood moguls these days, yet this made T2 work – it shows throughout the film that it was well thought out, and measured in production. The film is actually set in 1994, ten years on from the events of the first film (though T2 opens with a brief blistering Future War sequence, which shows in slightly more detail the raw and furious struggle for survival between man and machine). It’s made clear to us that the stakes are high too – the fires of nuclear war are another of the opening scenes, reminding us that the future is full of foreboding and pain. Once again, there is a fight for the future at hand. Every scene in this film is well structured and slickly put together. One of my favourite parts of T2 (though in truth, I have many favourite parts) is when the Terminator barges into a biker’s bar, stark naked, and demands clothes – it’s a great, well-staged fight. T2 is not as fast-paced as its predecessor, but once again there is no superfluous action. The tension ramps up in the build-up to the terminators finding John Connor at virtually the same time (the musical score here by the way is brilliant, overlapping the ominous T-800 and T-1000 tunes), and the T-1000’s pursuit of John with a truck is one of many exhilarating scenes. Away from the action, we have moments for each character to establish themselves and they all get a chance to shine. 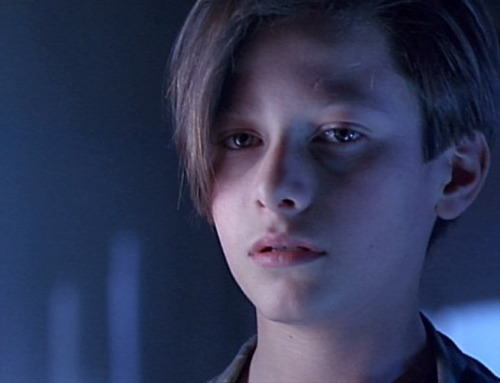 John Connor (played by then-newcomer Edward Furlong) is a tearaway, having initially been brought up by Sarah to believe he was destined to save humanity, only to learn that his mother is in fact, crazy. Naturally, this has messed with his head somewhat, and the subsequent discovery that his mother was right comes – as it would – as a shock to the system. 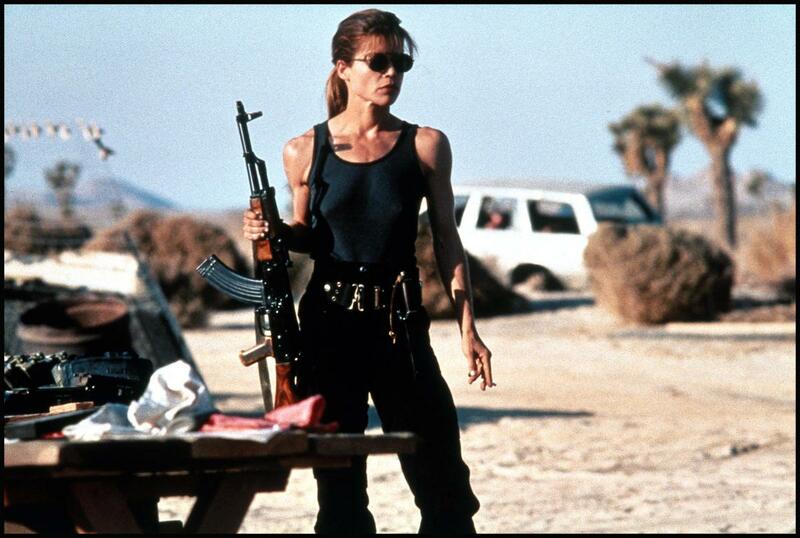 Sarah Connor (again played by Linda Hamilton) has naturally hardened. With the weight of the world on her shoulders, Sarah has been seeking to stop Judgement Day and train her son to be the warrior who will destroy Skynet (if she fails to stop Skynet from ever being built). Having ended up being arrested and then locked away in a psychiatric hospital, and denied access to her son, Sarah has naturally been going mad, unable to convince anyone of the truth and even having her own son reject her. Arnold Schwarzenegger is once again the Terminator, and once again he fulfills the role without a problem. He is a natural at the role, as is Robert Patrick as the T-1000 (the new Terminator sent back to kill John). The clashes between these two in the film are thunderous (as is expected of two completely unstoppable, determined machines). In fact, Robert Patrick is an unsung hero of this film. 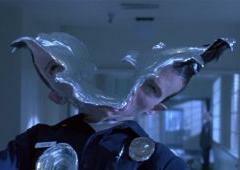 His portrayal of the ruthless assassin that is the T-1000 is brilliant. He moves with deadly grace, and his face conveys the look of something utterly focused and completely implacable. Much of T2 deals with destiny. Sarah is determined to prevent Judgement Day from ever happening, and to this end, is prepared (or thinks she’s prepared) to do whatever it takes to change the future. When faced with committing murder to do exactly that, Sarah finds she can’t make the cold, mechanical move – she is after all, a human being, and despite years of suffering and pain, she chooses not to abandon that. There is also the move to blow up Cyberdyne Systems (the precursor to Skynet), in a bid to change the future. The final, climatic scene features some of the best moments in any film I’ve ever seen. From the tanker of liquid nitrogen to the Terminator coming back from being half-smashed to pieces and coming back swinging, I cannot help but think that the Terminator franchise should have ended here. Right at the end, we get a reminder of the need to value human life – a message that will always be important.